Oh! A collection what has cheetah spots. And is also spotty. Hallo, fellow polish junkies! The leaves are off and it&apos;s just starting to feel like Fall here in Toronto. What’s new here in Toronto, Canada? 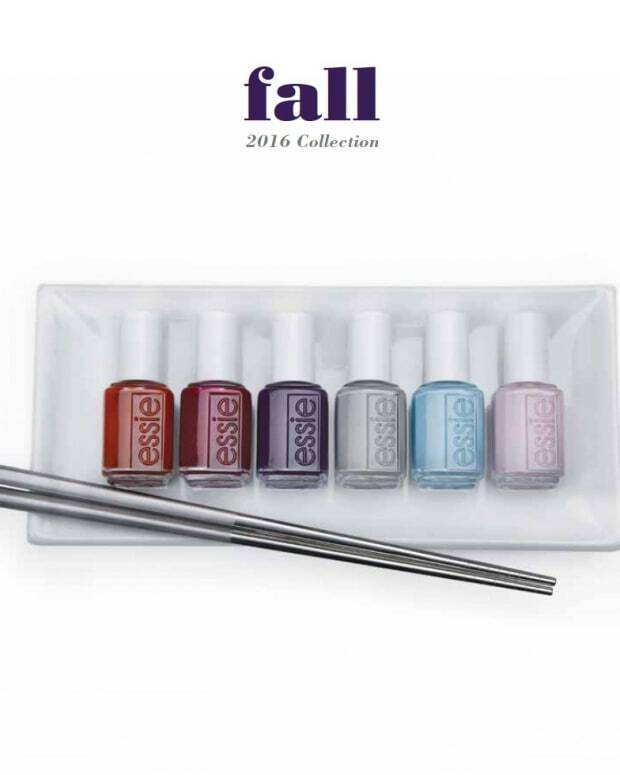 The Color Club Midnight Muse Fall 2016 collection! Trade Secrets has it in-store and online right, right now! Shall we have a look? 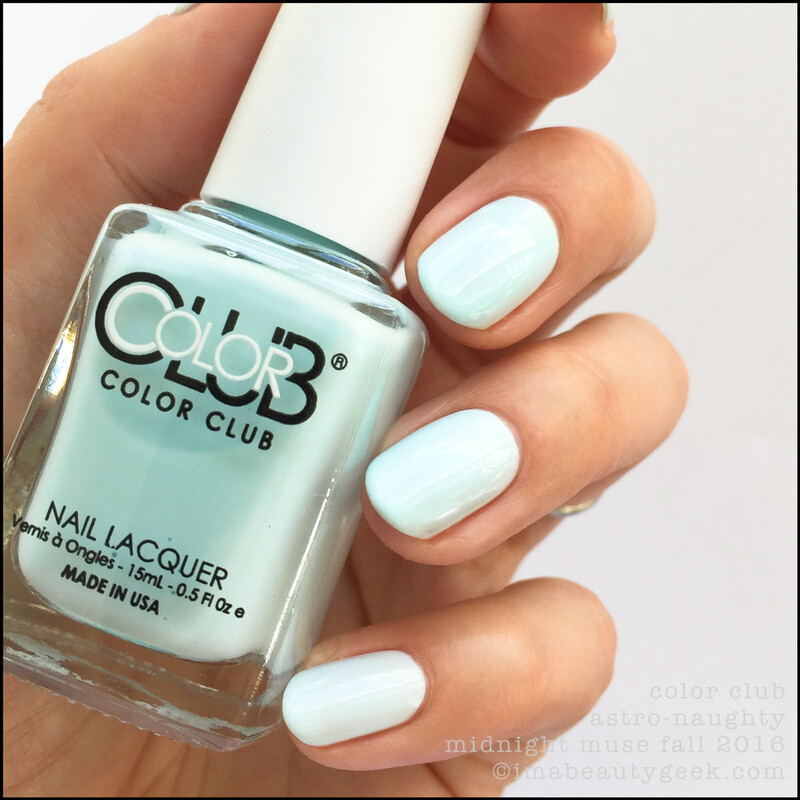 Color Club Astro-Naughty – Midnight Muse Fall 2016 (above). Oh boy! She’s so pretty in her pale icey blue-ness! But I despise her. That’s 4 coats. Yes, you read that right. 4. She’s incredibly thin, doesn’t want to level, and she’s crazy challenging to work with. I know she’s pretty and I know you wannit but take a pass on this one, k? 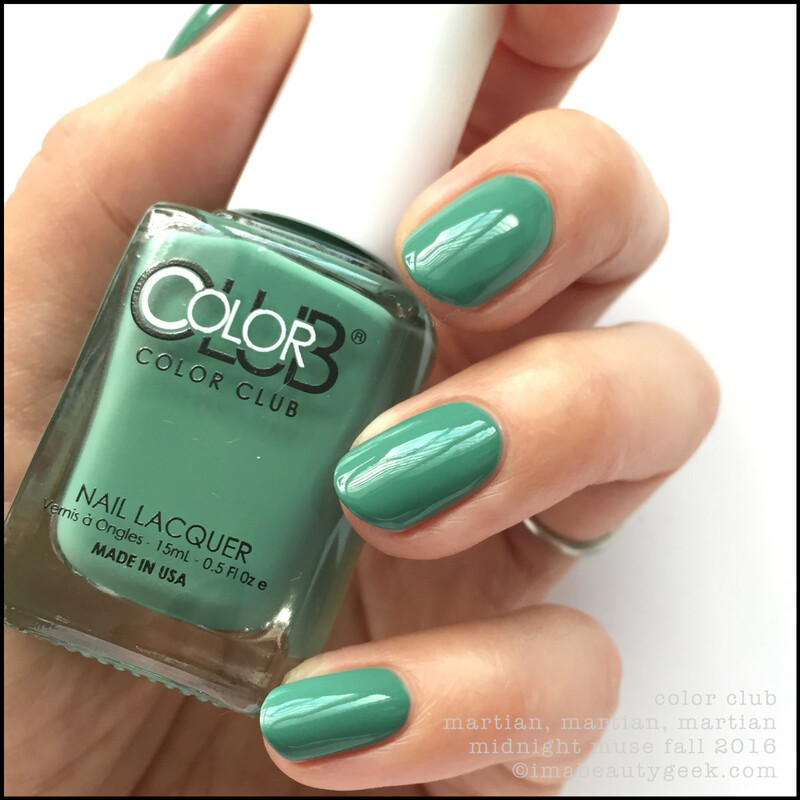 Color Club Martian, Martian, Martian – Midnight Muse Fall 2016 (above). Unh! Where Astro-Naughty was a crap formula, this one is the bee’s knees! That’s 2 coats where I could have done 1 thicker one. (I prefer thin though – stuff dries faster that way). She applies like a dream and she’s somewhat of an uncommon green, so if you don’t have one like this, get this one! Color Club Cheetah-Me-Not over Martian, Martian, Martian (above). If you’ve been hoping someone out there would make you a good glitter coat that has cheetah confetti in it, this isn’t the one you’ve been waiting for. The payoff in one coat is spotty, and multitudes of glitter get stuck in the brush. It’s tedious to try and paint this stuff on with an even distribution. If you absolutely neeeeed to have this glitter, let your base shade dry before you apply this. You’ll have much better success if you can blob it on and manipulate it without fear of dragging up your colour coats. You’ll have to fish for the cheetahs too. Like, seriously <}}}><. 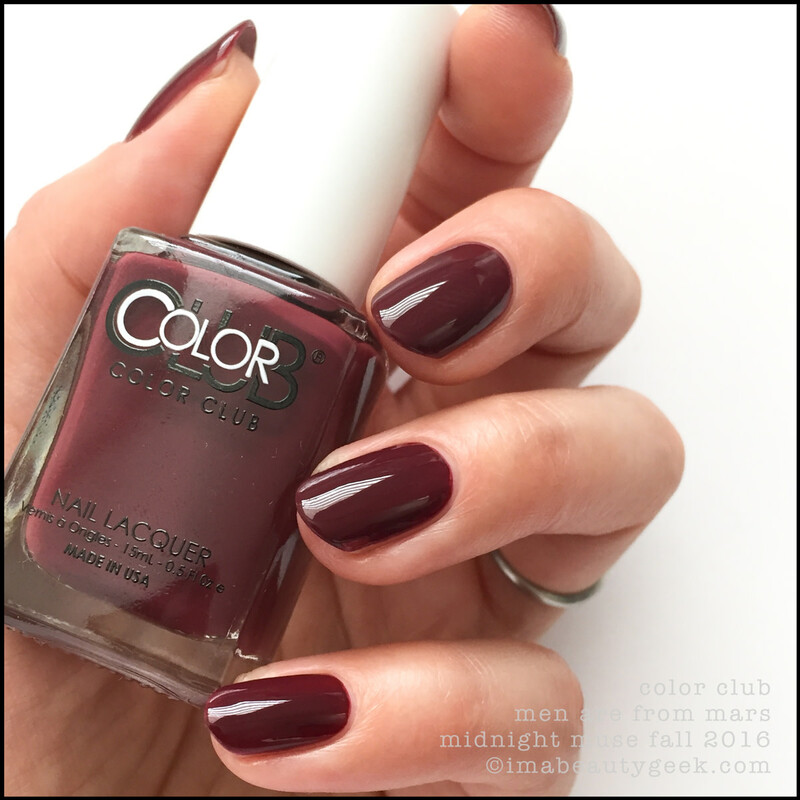 Color Club Unphased – Midnight Muse Fall 2016 (above). I love this polish. Oddly, I didn’t think I would. It’s a very interesting shade of Fall that’s somehow glowing. In bright light, it’s an insanely shimmery warm gold. 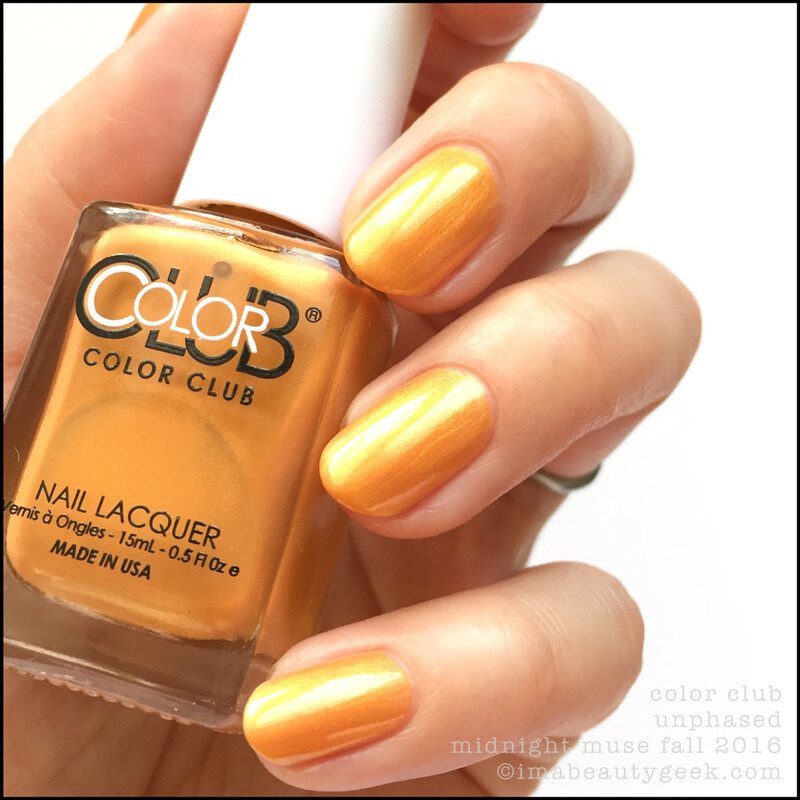 Color Club Unphased (lower light) – Midnight Muse Fall 2016 (above). In more shade, it looks much more like a moody pershimmery. Ha! New colour descriptor word! 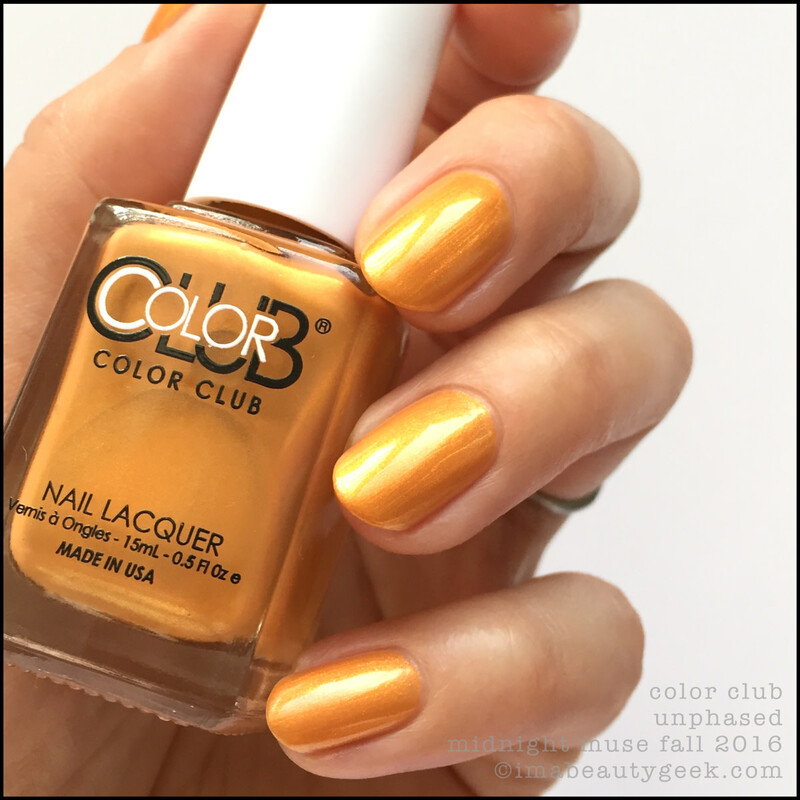 That’s 2 easy coats to get you that glowing, flashy Autumn warmth. Color Club Cheetah-Me-Not over Unphased (above). Why, Color Club? Why? 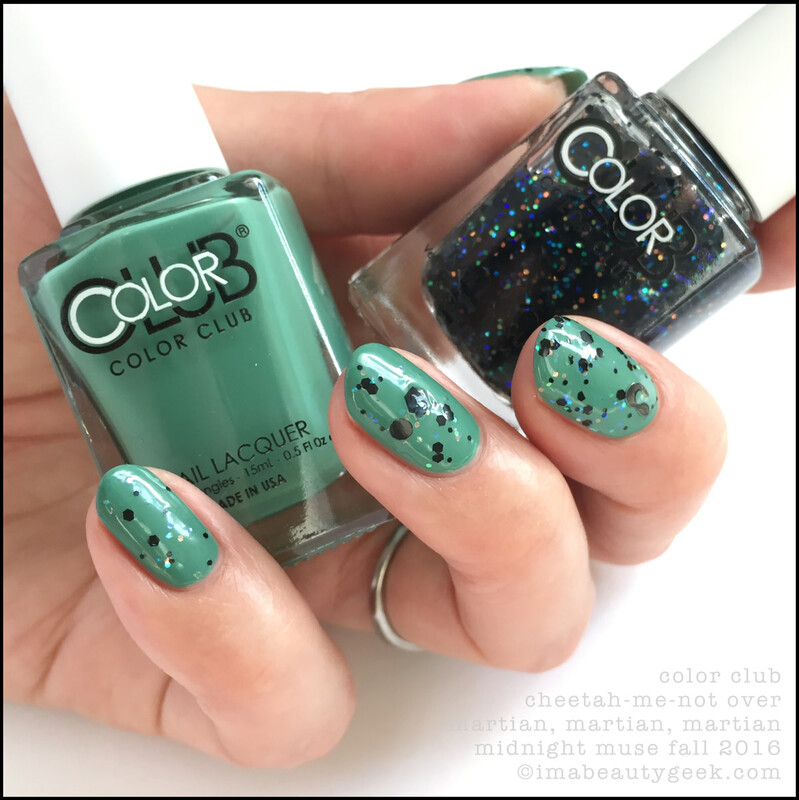 Color Club Meteor-Right – Midnight Muse Fall 2016 (above). Oooh! That’s purdy! My notes say it’s 2 coats so it must be 2 coats. Oh! And I turned on my desk lamp for this so I could catch the finish for you! It’s awesome. It’s also pretty old-school, but in a much better formula. Color Club Meteor-Right (above). 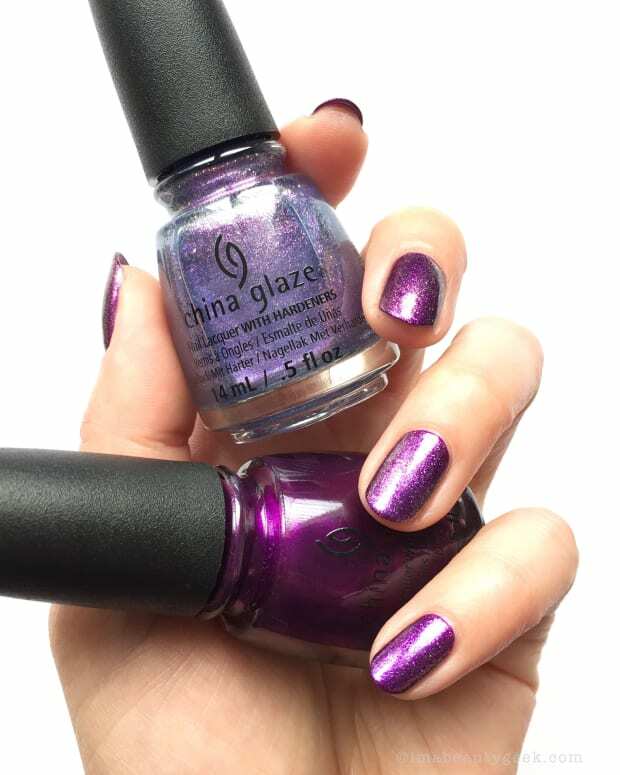 Twenty years ago, you’d have had to do 4 or 5 coats to get this kind of opacity but today, just 2! I’m diggin’ it. 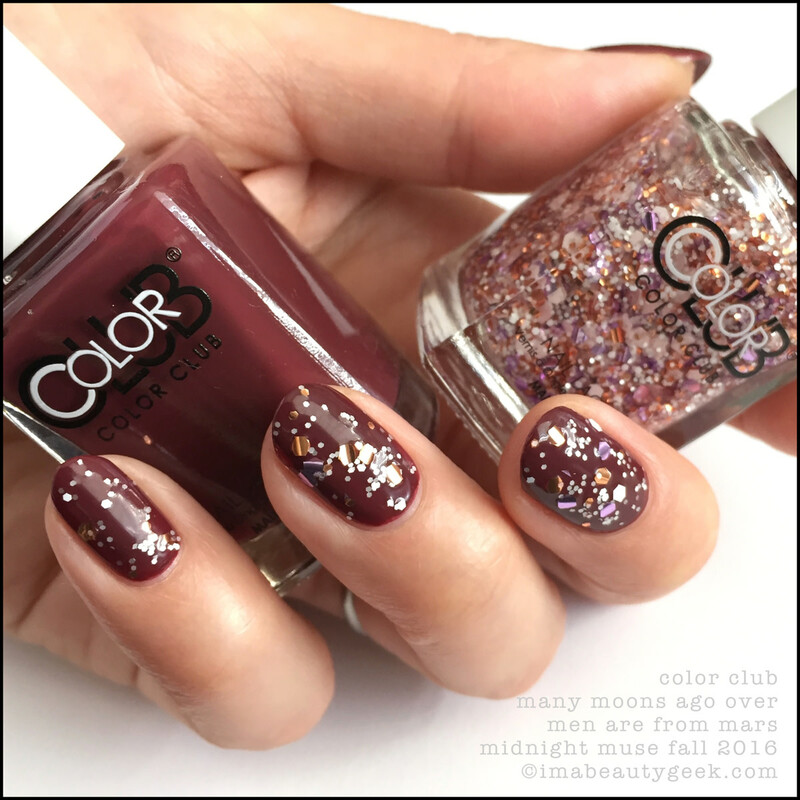 Color Club Men Are From Mars – Midnight Muse Fall 2016 (above). This lobster-hands-poppin&apos; thing had a heavily plasticized finish which gives it incredible shine when it’s dry. It also makes it tricky to work with. She was kind of sticky and really took her time to level, but she’s do-able (and marginally patchy) in 2. Color Club Many Moons Ago over Men Are From Mars (above). And lastly, this! Fun, right? And a pretty good payoff in 1 coat! But look closer… The foil hex glitters are curling at the edges. That’s not terrible if they’re facing down but when they curl up? Jeebz, Color Club – you’re so much better than this. Now the swatches are done, how do I really feel? Well, I do like that they’ve tried to give us stuff that’s playful. That said, I feel like some of these polishes don’t belong in Color Club bottles and should go directly into Funky Fingers bottles instead. If you get what you pay for, at least ½ this collection isn’t worth the Color Club price point but I totally think it’s worth the FF price. If you’re lookin’ at the good half of this collection and thinkin’ you need to get hands on it, here in Canada hit tradesecrets.ca or head into one of their stores. While you’re browsing, you might even see some of the limited edition pooooh! In the US, amazon.com has loads of Color Club. For more details: colorclub.com.